Cisco and Arista reached a settlement resolving their long-running patent dispute. 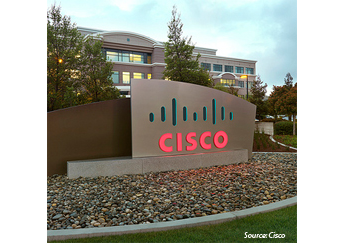 Under the deal, Arista will pay $400 million to Cisco, and Cisco agrees not to assert against Arista patents that were included in the litigation as long as Arista shall continue to implement workarounds it had put in place to certain of those patents. In an SEC 8-K filing, Cisco also said Arista agreed to make certain changes to the user interfaces of its products. The parties also to use an arbitration process to resolve any further patent infringement claims for the next three years, and not to bring to an action against the other for patent or copyright (except for any claims of source code misappropriation) infringement for the next five years. Cisco filed a patent infringement lawsuit against Arista Networks, claiming that a dozen key switching features covered by 14 different U.S. patents held by Cisco were copied. In a blog post, Mark Chandler, General Counsel at Cisco, writes that none of these features are incorporated in industry standards andy were patented by individuals who worked for Cisco and are now at Arista, or who at Cisco worked with executives who are now at Arista. Specifically, Cisco's complaint cites the following technologies that are incorporated by Arista in their entirety into Arista’s products. Furthermore, Chandler argues that "Arista promotes the theft of Cisco’s intellectual property as a key differentiator for Arista versus other Cisco competitors." Bharti Airtel reached an agreement with Telecom Egypt under which it will acquire IRUs (Indefeasible Right of Use) on Middle East North Africa Submarine Cable (MENA Cable) and TE North Cable Systems. Specifically, Airtel gets the right to use fiber pairs on MENA Cable from Egypt to India with access to Saudi Arabia and Oman, and other fiber pairs from Egypt towards Italy. It also extends beyond MENA Cable, where Airtel will get the right to use a fiber pair from Egypt to France on TE North along with capacities on SMW5 and AAE1 cable systems. Financial terms were not disclosed. Telecom Egypt announces that its 50% owned subsidiary, Egyptian International Submarine Cables Company (EISCC), will acquire the Middle East and North Africa Submarine Cable (MENA) for a total value of US$90 million from Orascom Telecom Media and Technology Holding S.A.E. Telecom Egypt said the decision to acquire MENA Cable comes in line with its strategy to achieve a short-term return from this investment and to preserve the revenue stream of the submarine cable systems. MENA Cable is licensed in Egypt and Italy to operate a submarine telecommunications system connecting Europe to the Middle East and South East Asia. "The decision to acquire MENA Cable is one of the most important steps towards implementing the company’s strategic plan to ensure the sustainability of submarine cable revenues and reinforce the contribution of the USD revenue stream. The new cable will add to Telecom Egypt’s network of submarine cables fortifying TE’s network offering to the maximum number of routes between India and Europe as well as add a new gateway to Europe through Italy," stated Ahmed El Beheiry, Managing Director and Chief Executive Officer. Lumina Networks has enhanced its OpenDaylight-powered SDN controller with support for the open source PacketCable multimedia interface (PCMM). Lumina's SDN controller with PCMM protocol enables cable operators (MSOs) to manage QoS for services such as VoIP by controlling QoS parameters in the cable modem termination system (CMTS). PCMM also provides resource auditing and management and a robust security mechanism. Lumina’s SDN Controller provides an open source-based platform using a PCMM plugin and allows MSOs to deploy SDN without vendor lock-in. Lumina Networks, a start-up based offering an SDN controller powered by OpenDaylight, announced $10 million Series A financing, including $8 million in new funding led by Verizon Ventures. Other new investors included AT&T and Rahi Systems. Lumina was formed in August 2017 as a spin-off from Brocade. "This investment by both Verizon and AT&T demonstrates the strategic importance of open source networking to the automation and digitization of their networks,” said Andrew Coward, Founder and CEO of Lumina Networks. “We understand the value of our mission to take open source networking out of the labs of our customers and into production deployment. This funding will enable us to reach a wider customer base and realize the industry vision of easily deployable open source software-defined networking (SDN)." SpaceX successfully launched the "Merah Putih" satellite on behalf of PT Telkom, Indonesia's largest telecom operator. The launch used a Falcon 9 rocket from Cape Canaveral Air Force Station, Florida. The geosynchronous Merah Putih satellite, which is based on the SSL 1300 platform, carries an all C-band payload of 60 transceivers capable of supporting a wide range of applications, including providing mobile broadband across Indonesia and Southeast Asia. Google Cloud Platform began offering virtual workstations optimized for graphics-intensive applications and machine learning inference based on the NVIDIA Tesla P4 GPU. AT&T and RapidDeploy are collaborating to provide Public Safety Answering Points (PSAPs) access to RapidDeploy's cloud-based Computer-Aided Dispatch (CAD) platform. RapidDeploy, which is built on an open-API architecture, is a modern update to the dispatch solutions currently used by PSAPs. It can be integrated with relevant and emerging data-rich sources to improve public safety's situational awareness. AT&T is connecting PSAPs to the RapidDeploy platform using an AT&T Virtual Private Network. Rostelecom, Russia’s national telecommunications operator, posted Q2 revenue of RUB 77.365 billion, up 3% from a year earlier. The company cites pay-TV and fiber broadband services as key drivers as it invests in enterprise cloud services, data centers and cybersecurity services. In its quarterly report, Rostelcom also noted a positive marketing result from its role as regional sponsor to World Cup 2018. The number of local telephony subscribers decreased by 8% to 18.3 million. Net profit increased by 16% to RUB 7.0 billion compared to the first half of 2017. 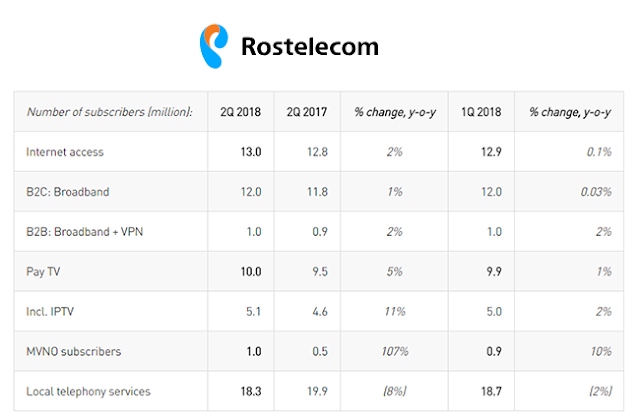 Mikhail Oseevsky, President of Rostelecom, stated "The Q2 2018 results came in line with our expectations. Rostelecom has gained momentum: revenue has been growing at a solid average annual rate of 5% in the last 12 months. Our digital segment, which currently accounts for 53% of our top-line, has contributed significantly to this growth. Our growth engine is delivering and we are also increasing our competitive positions in the key pay-TV and broadband segments, thanks to a growing subscriber base and higher ARPU. This was achieved by promoting new services such as “Smart Home” video surveillance, where we saw the subscriber base grow three-fold in the reporting period. Higher demand for cloud services, data centers and information security solutions is also contributing to our top-line and is coming from corporate and government clients." Twilio, the cloud communications platform, posted total revenue of $147.8 million for the second quarter of 2018, up 54% from the second quarter of 2017 and 14% sequentially from the first quarter of 2018. There was a GAAP loss from operations of $22.0 million for the second quarter of 2018, compared with GAAP loss from operations of $7.1 million for the second quarter of 2017. Non-GAAP income from operations came in at $2.2 million for the second quarter of 2018, compared with non-GAAP loss from operations of $4.7 million for the second quarter of 2017. 57,350 Active Customer Accounts as of June 30, 2018, compared to 43,431 Active Customer Accounts as of June 30, 2017. Dollar-Based Net Expansion Rate was 137% for the second quarter of 2018, compared to 131% for the second quarter of 2017. Launched the Twilio API for WhatsApp, allowing customers to add one of the most important global messaging channels to their applications through the same API they use for SMS, MMS, RCS, Facebook Messenger, and LINE. 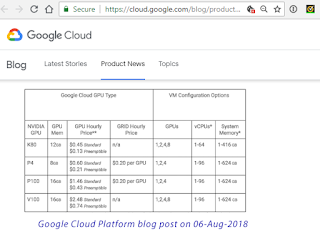 Collaborated with Google to integrate Google Cloud Contact Center AI into Twilio Flex, the first fully programmable cloud contact center platform. Announced Twilio Build, a new partner program to support Twilio’s growing ecosystem of technology and consulting partners as they work with Twilio to innovate for their customers, grow their businesses, and transform the communications industry through the power of software. Received approval from EU data protection authorities of our Binding Corporate Rules, furthering our commitment to maintaining the highest standard of data protection. Opened a new Atlanta office, with plans to add more than 50 employees over the next few years, including sales, human resources, and engineering roles. Issued $550 million in aggregate principal amount of 0.25% Convertible Senior Notes due 2023. Open Fiber has raised EUR 3.5 billion in financing from Italy's Cassa Depositi e Prestiti (CDP), a consortium of international banks, and the European Investment Bank (EIB) for the rollout of its FTTH network. The company has now secured EUR 6.5 billion in funding commitments for its ambition to reach 19.5 million residences across Italy. The consortium of banks includes BNP Paribas, Société Générale and UniCredit as underwriters, along with Banca IMI, Banco BPM, MPS Capital Services and UBI Banca, Credit Agricole, ING, Caixa Bank, MUFG Bank, Natwest and Banco Santander. Wind Tre is currently marketing Open Fiber to its mobile customers in Tuscany. Earlier this year, Open Fiber reach a deal to deliver content from Sky Italia to its FTTH customers. Samsung Electronics announced mass production of the first 4-bit (QLC, quad-level cell) 4-terabyte (TB) SATA solid-state drive (SSD) for consumers. Samsung said its 4-bit 4TB QLC SATA SSD maintains performance levels at the same level as a 3-bit SSD by using a 3-bit SSD controller and TurboWrite technology, while increasing drive capacity through the use of 32 chips, all based on 64-layer fourth-generation 1Tb V-NAND. The 4-bit QLC SSD enables a sequential read speed of 540 MB/s and a sequential write speed of 520 MB/s. 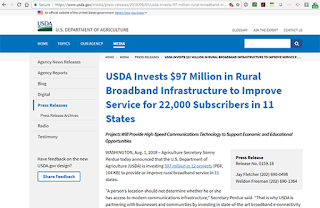 The U.S. Department of Agriculture (USDA) announced plans to invest $97 million in 12 projects in 11 states: Arizona, Iowa, Idaho, Maryland, Minnesota, Missouri, Nevada, Oklahoma, South Dakota, Wisconsin and Wyoming. 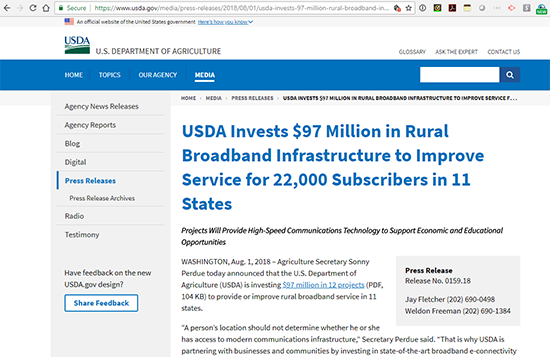 The funding is intended to improve rural broadband. The funding will be made available through the Telecommunications Infrastructure Loan Program and the Community Connect Grant Program. Chibardun Telephone Cooperative, Inc. in Cameron, Wis., is receiving a $21.4 million loan to improve outside plant facilities in four (Almena, Cameron, Dallas and Ridgeland) of its six exchanges. It will construct 675 miles of fiber-to-the-premises and install associated electronics. Chibardun serves Barron and Dunn counties. Approximately 2,700 subscribers will receive improved service as a result of this loan. Osage Innovative Solutions, LLC in Tulsa, Okla., is receiving a $2.7 million grant to construct a hybrid fiber-to-the-premises and fixed wireless system in an unserved and economically depressed portion of the Osage Nation in Osage County. The company will offer speeds up to 100 megabits per second (Mbps) download and 10 Mbps upload to 139 households and 22 businesses. The Northeast Missouri Rural Telephone Company, in Green City, is receiving a $13.7 million loan to convert six exchanges from copper plant to fiber-to-the-premises. It will construct nearly 500 route miles of fiber. Northeast Missouri expects to improve service to 1,063 subscribers. On August 2, Acacia Communications reported Q2 revenue of $65.0 million, a decrease of 18% year-over-year. The GAAP gross margin was 38.8%; and there was a GAAP net loss of $3.2 million. 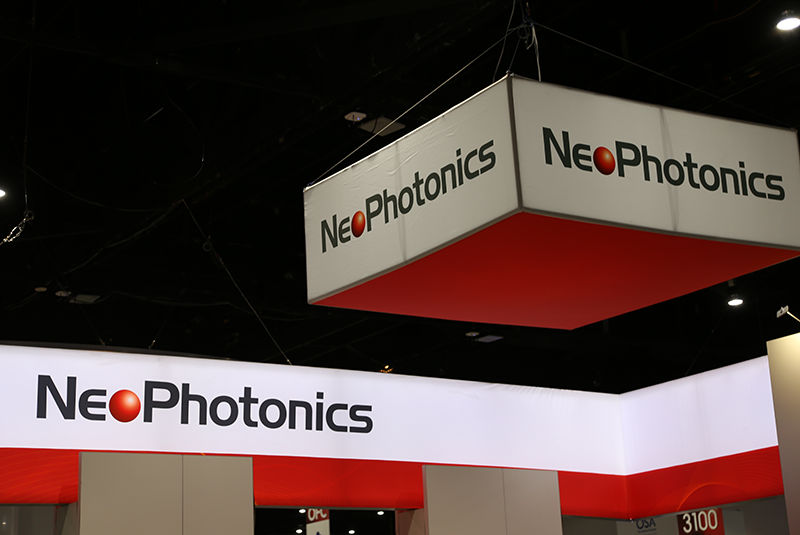 Non-GAAP net loss amounted to $3.2 million.